You've always been the best of friends. You've done practically everything together. But this past summer, you all went to different camps and started getting interested in different things. And when you went back to school, things were different between you. But you always loved Halloween, and you all knew you'd go trick-or-treating together. So on Halloween night, you all met on the street corner...but one of you wasn't there. You all raced to this friend's house...and it's been replaced by a spooky mansion. It's like your friend never existed. You will now face monsters and villains as you race to get your friend back. 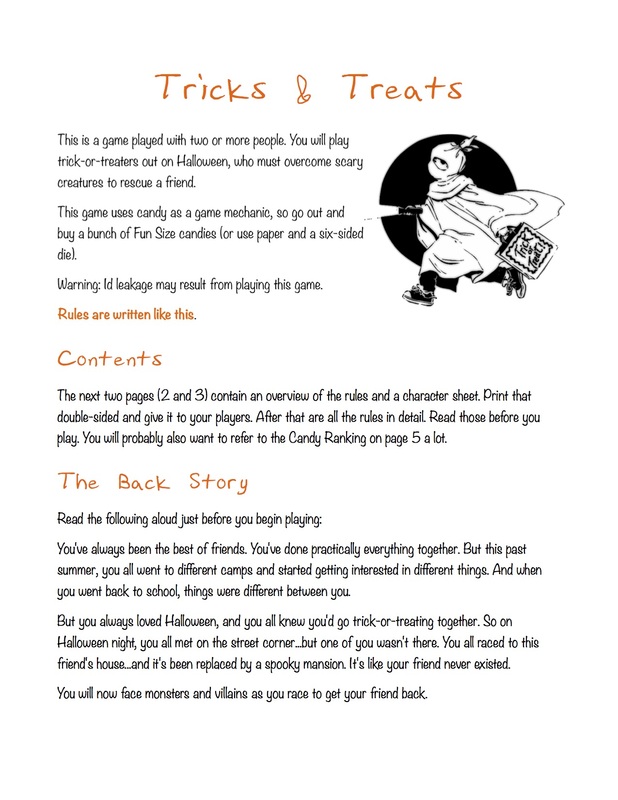 Tricks and Treats is a simple role-playing story game, designed to be played by kids and adults. It's about a group of trick-or-treaters that face monsters which are themselves based on the kids' fears and personalities. And the primary resolution mechanic uses candy. You'll get a 9-page PDF of all the rules, as well as mobi, epub, and azw3 files for all eReaders. 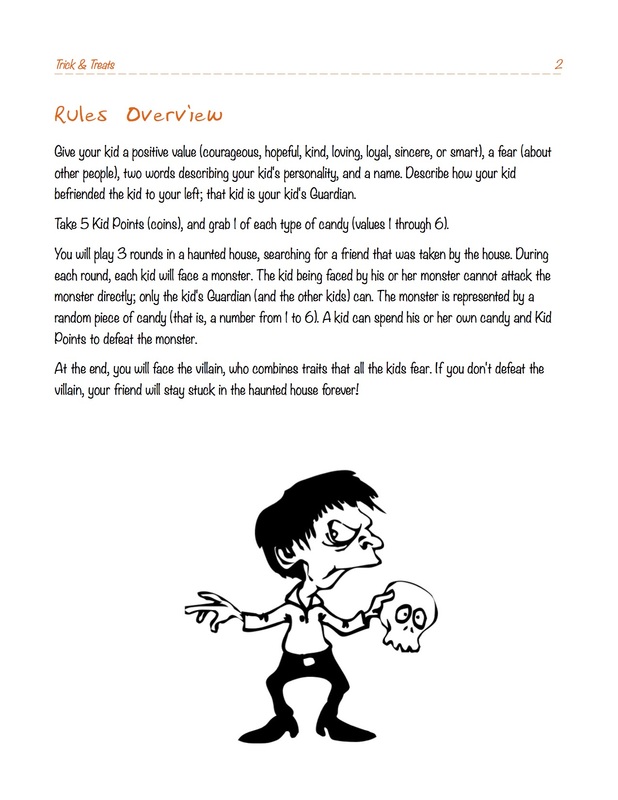 The PDF includes a simple character sheet with the rules on the other side, making a handy handout. Each player gets 6 pieces of candy (ranked from 1-6), plus 5 Kid Points. Monsters are drawn from a big bag of candy (or rolled on a d6). Players can spend candy or Kid Points to defeat them. The kids move through various rooms of a haunted house, fighting off monsters that represent how each kid has caused problems for his or her friends. In the final room, the kids face a villain who's holding an NPC friend hostage. If the kids have hoarded their candy wisely, they can get their friend back! Tricks and Treats is released under a Creative Commons Attribution-ShareAlike license (CC BY-SA 3.0).